FHA qualifying guidelines are more flexible than those of most conventional non-government lenders. However, not just anyone can qualify. You must have a sufficient and stable income, and show that you can responsibly manage debt. Here you will learn about the 7 steps that you need to follow when trying to qualify and apply for a FHA home loan. 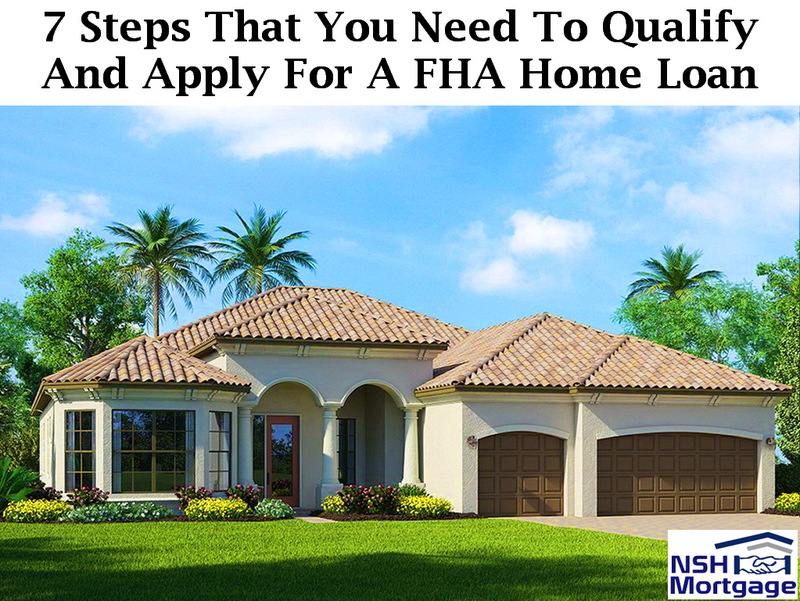 NSH Mortgage has the knowledge and tools to help you qualify and apply for a FHA home loan. Here is what you are going to be dealing with: residency, down payment, credit, documented income, CAIVRS, overlays, and beating overlays for FHA. You do not have to be a U.S. citizen. But you do need to show that you are in this country legally. And that the U.S. Citizenship and Immigration Services (USCIS) is likely to approve your continued residency. You will need a down payment of 3.5% of the property purchase price. But if your credit score is below 580 you will need to have a down payment of 10%. When acquiring the funds for a down payment. You can save up your money for it, or get the money as a gift, or even borrow money from an approved source. You can also get a FHA mortgage without a credit score. But if you have one, it must be a score of at least 500 for a loan with ten percent down, or 580 for a loan with 3.5 percent down. However, only 1.55 percent of FHA loan approvals went to those with FICOs between 500 and 549, according to a recent Ellie Mae report. You can have a low credit score, but your credit history should not look like a rap sheet. You have to be able to prove your income. Your income should be stable, meaning that you should receive it regularly and reliably. It should also be likely to continue for at least three years. Mortgage lenders generally assume that your employment income will continue unless there is reason to believe that it will not. Your new mortgage payment, including principal, interest, property taxes and homeowners insurance, should not exceed approximately one-third of your before tax gross income. All of your monthly bills, including house payment, credit cards, student loans, auto loans, and so on, but it should not exceed 43 percent of your income. Lenders will let you go as high as 50 percent of your income in certain cases for instance, your credit is excellent, you have lots of savings, or you purchase an Energy Star home. In addition, there are programs out there that can offer you a loan with your stated income. When underwriting for any government backed mortgage like FHA, the lender must check a database of people who have defaulted on government debt, such as taxes or student loans. This database is called the Credit Alert Interactive Voice Response System which is pronounced as cavers. In most cases, the check is just a formality. If your name turns up on that list, however, you will not be eligible for any government backed mortgage until you resolve the matter. Qualifying for FHA financing is not cut and dried. Underwriters look at the total picture, and may be more or less lenient, depending on the overall strength of your application. In addition, not all lenders apply FHA guidelines the same way. Many lenders impose tougher guidelines called overlays which are more than FHA requires. For example, a lender might set a minimum FICO of 620 instead of 580. If you are concerned about being approved, ask about overlays when you interview prospective lenders. Once you find a mortgage lender with a good FHA rate, it is time for you to apply for a FHA home loan mortgage. Here is a list of documents that you will probably need when you apply for your loan. For salaried employees, that means your last two pay stubs and W-2s covering your most recent two years of employment. For self-employed borrowers, that means two years of tax returns and year to date financial statements. If you earn income from commissions, bonuses, or a second job, you will need to have received it for two years before it can be used to qualify for a FHA mortgage. You can use Social Security, disability, pensions, unemployment, ADC payments, interest or dividends to qualify for your mortgage. You will need to prove that you get it regularly and that it will continue for at least three years. What about unemployment compensation? There is one situation in which you can use unemployment compensation to qualify for mortgage financing. Seasonal employees with a 2 year history of working and then collecting unemployment can count the unemployment compensation as income. Aside from your down payment and closing costs, the FHA sets no minimum amount for assets. However, lenders like you better if you have savings to pay several months of mortgage payments if your income temporarily stops. To document your checking account funds, furnish your most recent two months’ statements, all pages. Do not bounce any checks in the months before you apply for a FHA home loan, it does not look good. For your savings accounts, investments, and retirement accounts, provide your most recent quarterly statement or your last two monthly statements. If you have joint accounts with someone who is not applying for the loan with you, get a letter verifying that you have access to 100 percent of the money in the accounts. If someone gives you part or all of the down payment, you have to prove that it is a gift, and that it comes from an acceptable source. FHA wants to be sure that you did not borrow the money or get a gift from someone who would benefit from the sale, like the seller, real estate agent or your loan officer. You will have to provide a gift letter and copies of statements proving that the money came from the giver. If you pay or receive child support or alimony, you need to supply a copy of your divorce decree. You do not have to disclose your support payments. But if you want to use them to qualify for your mortgage, you must prove the amount and duration. You will also have to show that you receive it regularly and on-time. Canceled checks or records of your deposits can take care of this requirement. Do not make big ticket purchases on credit. Do not apply for new credit cards or take on other consumer debt. And please, do not quit your job unless you are switching to a better paying one in the same field. Your credit and employment will almost certainly be re-checked before your home loan funds. Anything that indicates that your debt to income ratio has changed, or that your credit score has dropped could get your loan approval revoked. Also try to avoid other common home buying mistakes while you are at it as well.